Swap it like its hot. Skylanders was a game that surprised a lot of folks when it was unveiled at E3 two years ago. I can remember seeing the little figures come to life in a back room at the Activision booth and immediately thinking to myself, ok, this thing is going to catch on. We're now a few games and 50 some characters later and Skylanders is getting what might be the biggest change to the series yet. Skylanders Swap Force is the first game that looks, feels, and plays next-gen. The first thing to know about Swap Force is this: despite the game requiring a brand new portal to work, all of your existing Skylanders figures are fully compatible with the game. In fact, those characters you have maxed out at level 15 can now be upgraded to level 20. Swapforce's main hook is the ability to swap the top and bottom of characters creating brand new characters on the fly. With 16 of these characters available at launch there are 256 possible new character combinations right from the get go. For instance we saw a character named NightShift who was this undead vampire boxer. Another character was this chicken that while deadly on the attack, was a bit slow on movement. Swapping NightShift's bottom with the chicken's yielded a character capable of faster movement and deadly attacks. The character swapping isn't just to make cool combinations, it's utilized in the gameplay too. While previous zones would block you out if you didn't have a character of a certain element on the portal, now new zones require two elements. While you can use a co-op combination to get through the gate, having a swapforce character of both elements would also work. In addition to the gated sections there are also challenge sections which require certain elements and abilities. In one section we saw a pirate squid character perform a wall climb challenge to unlock unique items - but the only way to do it is to use a character who's base is climbing capable. While most of the combat and level design seems similar to previous games, there is one big addition - the ability to jump. While I didn't get to see any specific uses of jump integrated into puzzles, we were told that levels would use it for some light platforming elements and that it changes up the combat quite a bit in the versus arenas. In terms of co-op the game still only features local co-op play, but the addition of the swapping characters can really mix things up. In essence you'll have four elements at a time to work with. There's also some new modes of play like a survival horde mode which should help keep fans interest once they completed the main campaign. 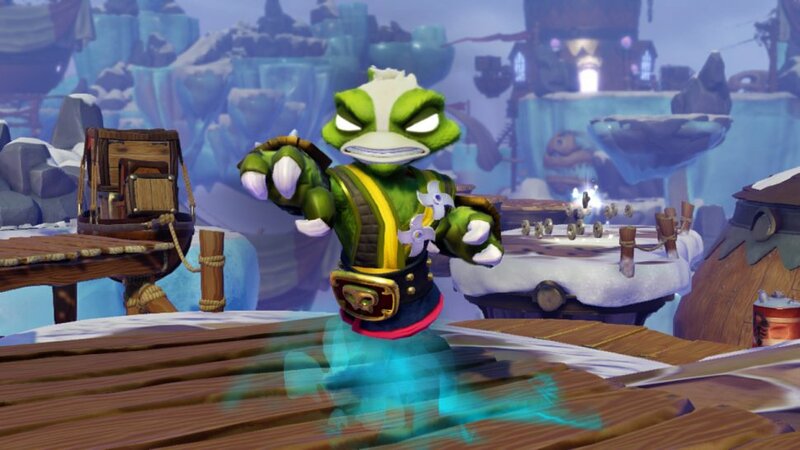 Two things stood out to me as impressive in Skylanders Swap Force. The first was immediately apparent, the game finally got an upgrade to its graphics engine. Textures on the characters were incredibly details, colors really punched, and there were a lot of small effects during combat. For instance one new character was a ninja skunk who had the ability to "cloak." When cloaked he'd leave an impressive billowy green cloud in a large area concealing his actual location. The second standout thing was just how inventive the characters are, like those examples given above. The characters are fun, inventive, and the swappable means random name combinations based on their attributes. 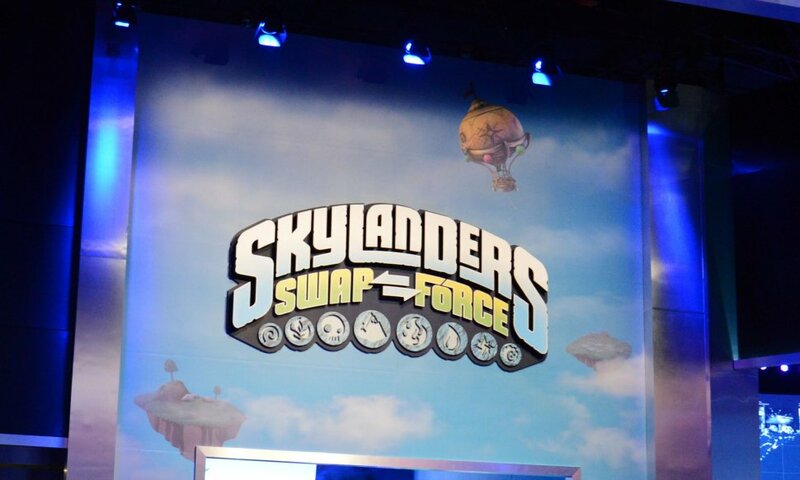 Skylanders Swap Force is planned for current gen (Xbox 360, PlayStation 3, Wii) and next-gen consoles (PS4, Xbox One, Wii U). It'll come bundled with the portal and two Swap Force characters. In addition there will be 8 new light core characters available at launch.